Data collection techniques for behavioral studies of travel behavior. My current focus is on the us﻿e of social network analysis in studying transportation decision making under social interactions. Incorporating social network data and modeling is an emerging method in transportation demand modeling with future application in the planning and management of transportation systems. When institutions are interested in changing the behavior of its members, it is important to understand the determinants of behavior. Differentiating social effects from non-social effects are of interest to any parties interesting in altering human behavior in order to accomplish certain objectives. Social interactions research in transportation deals with three areas: (1) social cooperation, (2) social influence, and (3) social capital. For example, travel behavior researchers have found that individuals’ cycling behavior is influenced by the perceptions and behaviors of others (i.e. social influence). Outreach efforts to improve cycling perceptions may increase the cost-effectiveness of infrastructure improvements. There is a need for models to correctly differentiate these effects to guide government, non-profit, and for-profit organization on the level of emphasis and investment in varying policy efforts. This work has spawned (1) collaborations with researchers in the Netherlands and the UK, (2) an article in the Journal of Transport Geography on behavioral issues in social influence models, and (3) articles in review for the journals Transportation Research Part A, Transportation Research Part B, Transportation, and Journal of Choice Modelling. Informational Conformity in Cycling. Qualitative studies have noted the importance of social influence in cycling behavior. Specifically, individuals’ friends, families, and co-workers may provide information on the benefits of cycling. This can start a process in which the individual may begin to research the suitability of cycling and adjust their opinions and behaviors. To test for this effect statistically, I model bicycle ownership on a national scale by using data from the National Household Travel Survey. 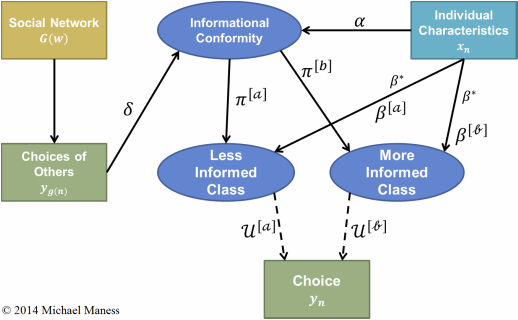 Specifically, a latent class discrete choice model is formulated which places individuals into classes based on information exposure. Preferences for bicycle ownership vary between these classes. Information is signaled by city-level bicycle usage where greater usage may induce households to reevaluate their preferences towards bicycle ownership. Estimation results show that these “more informed” households have a higher probability of owning a bike due to being less sensitive to smaller home footprints and limited incomes. Additionally, a Bayesian inference procedure is proposed which allows for describing a distribution of market equilibria. This provides a practical tool for forecasting, since there is the possibility of multiple equilibria in these models. A procedure for testing and predicting the number and locations of equilibria is novel in social interaction models of travel. Comparison of Position Generators and Name Generators as Social Capital Indicators in Modeling Activity Selection. Existing research incorporating social networks and social capital into activity and travel behavior models has tended to use name generator data. But using name generators and interpreters in surveys increase respondent burden and survey length. The position generator is a technique used in the social science to study social capital and allows for measuring network diversity and extensity of access to networked resources. The influence of these measures are not known in the context of activity and travel. Additionally, the dataset provides an opportunity to compare the performance of a name generator and position generator in an activity context. This chapter proposes using a network diversity indicator from a position generator to explain and predict activity selection. The sensitivity of choice models to the design of position generator questions is unknown. Thus, understanding the robustness of length of the questionnaire list may provide insight into position generator list length and its effect on model fit and parameter estimation in choice models using network diversity indicators. A case study using the Pew Internet Personal Networks and Community survey is performed to explore the effect. Social capital was correlated with activity participation for all of the activity types analyzed. Network diversity as measured from the position generator was found to be a reasonable explanatory covariate and predictive variable for activity participation. The network diversity indicator was found to hold more explanatory and predictive power than core network indicators from a name generator. Estimation Bias and Model Selection Error due to Misspecification of Social Network Data. In social influence choice models using social network data, elicitation of social contacts is primarily done through a name generator. While popular and effective when designed properly, data from name generator can suffer from issues related to poor context, respondent burden, respondent recall, and poor questionnaire design. 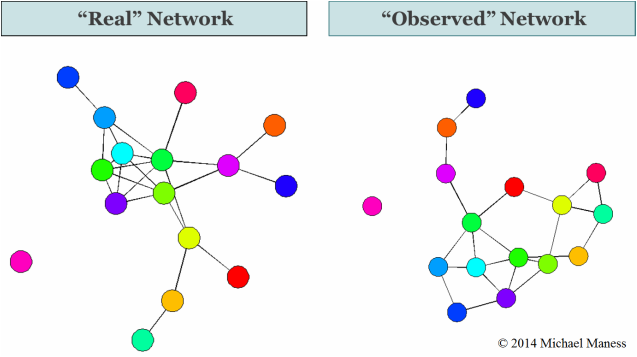 These issues can affect the quality of the network data used in choice models due to misspecification of social networks. Due to this, understanding the robustness of social influence choice models in the presence of misspecified social networks is needed. Gaining this understanding can guide methodologists on ways to handle the misspecification as well as aid applied modelers in understanding potential pitfalls in their analyses. In this study, a simulation experiment provides guidance on how popularity and clustering in social networks correlate with estimator bias and errors in model selection. Exponential random graph models (ERGMs) are used to generate small-world networks. Additionally, an ERGM simulation is proposed to represent misspecified networks. Results show that the number of incorrect network ties and the strength of social influence have the greatest impact on estimator error and incorrect model selection. Individual-level effects parameter estimates remained unbiased as social influence parameter estimates became downwardly biased. Sensitivity of Discrete Choice Models to Social Diversity Indicators from Position Generators: A Case Study. Existing research into the robustness of position generators is limited. Results tend towards evidence that for measuring the extensity of one’s social network and access to resources, that occupational list design in position generator is robust to changing the listed occupational types. Its limited use in travel behavior analysis also motivates understanding its robustness in designing activity surveys to incorporate position generator questions. Using a network diversity indicator from a position generator is new to activity-travel analysis as posited in Chapter 2. The sensitivity of choice models to the design of position generator questions is unknown. Thus, understanding the robustness of length of the questionnaire list may provide insight into position generator list length and its effect on model fit and parameter estimation in choice models using network diversity indicators. A case study using the Pew Internet Personal Networks and Community survey is performed to explore the effect. Model fit was found to significantly improve for all sizes (2 - 21 occupations) of the occupation list in the position generator. Bias and variablitity in parameter estimates were found to be robust as MSE results were low and steady until occupational list size decreased to about 10 to 15 occupations. Similarly, bias and variablitity in parameter ratios were found to be robust as MSE results were low and steady until occupational list size decreased to about 5 to 10 occupations.